Though sausages are a dominant feature in this recipe, parsley enhances the taste. Parsley is a wonderfully nutritious and healing food, it is often under-appreciated. Most people do not realize that it is more useful than just a decorative garnish. Parsley is an excellent source of vitamin A, vitamin C, and vitamin K. It helps in keeping healthy heart and protects against rheumatoid arthritis. Lightly coat the pan with olive oil and set to medium heat.Once hot, place the sausages in the pan. Brown each side (about a minute). Heat some oil in the pan and add onions. 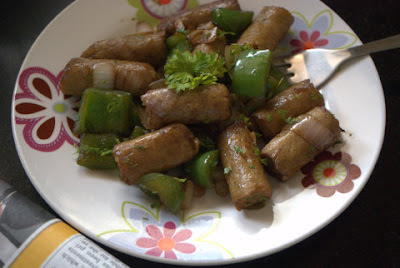 When the onions turn transparent, add capsicum, a pich of salt (remember sausages already have salt) and pepper. 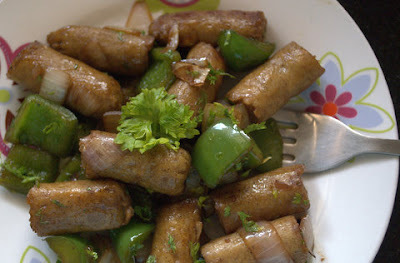 Add soya sauce and sausages and mix well. 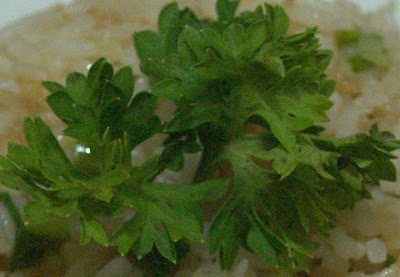 Garnish with parsley and serve hot. This is my submission to this week's Weekend Herb Blogging, hosted by Anna from Anna's Cool Finds. Thanks for participating! Looks delicious!